With years of experience shooting burlesque beauties, vintage vixens and scorching pinups I can offer a brilliant makeover service. Whether you live and breathe retro to pinup culture or just want to see how you’d look if you were at the centre of Golden age of Hollywood or a 1950s pinup, I offer a makeover experience with a difference. Whether it’s a treat for yourself or the ultimate gift for a special someone, you’ll have images to last long after the fun of shoot itself. 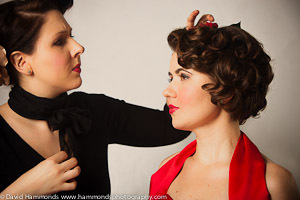 Vintage style guru, Gem works with a client on a makeover photo shoot. Using stylists and makeup artists drawn from the UK’s burgeoning burlesque scene or vintage subculture, you’ll be amazed just how amazing you can look. Unlike other makeovers, the pocture will never really date, evoking classic eras that continue to thrill and intrigue down the decades. 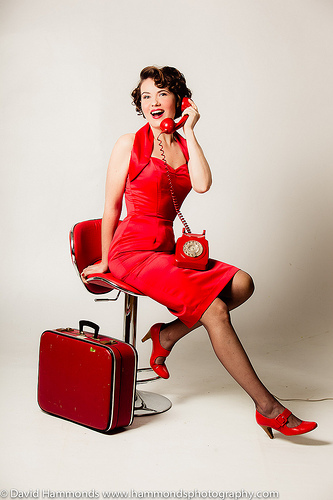 Your vintage/pinup photo shoot is tailor-made just for you and may take place in a local photo studio or out on some suitably glamourous location. Your favourite photographs from your session will be professionally retouched, using all the tricks of the beauty trade. You’ll enjoy a full makeover experience including hair, makeup and posing tips from a vintage stylist. We have access to a great range of vintage and retro clothing but if you’d like to keep your outfit can recommend options from wonderful vintage reproduction clothing labels or obtain them on your behalf. Your photo shoot experience will last 2-3 hours including the makeover and enough time to ensure there are a selection of mind-blowing images in the can. Even if you’ve never been at the heart of a photo shoot before, or have never enjoyed a make over – don’t worry. Any nerves will be calmed during a relaxed fun-packed session. A retouched image from a vintage makeover shoot. A short time after your shoot you will se sent a gallery of the best 80-100 images to view at your leisure. Your favourite 10 images will then be retouched and returned to you as high resolution digital files on a DVD in a presentation wallet. This includes rights to reproduce the images with commercial print labs as many times as you like. To ensure best results we can recommend suppliers sure to do a great job as well as local printing and framing services if you would like a large print for your home. For an additional £50, we can even place your images in a specially-designed 20-page glossy, coffee-table style book (with additional copies available for £25). *This price is a general guide. While most clients will pay exactly this there are sometimes additional costs such as clothing, accessories, or fees to access particular locations to realise your vision – these extras can be added to the price if supplied by us.